Blackest Night and Brightest Day have returned Ronnie Raymond to the land of the living. 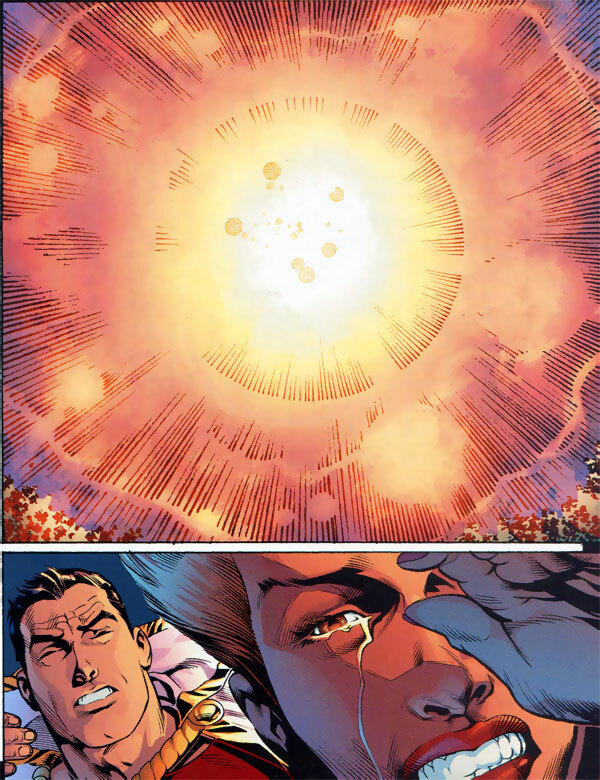 As we begin to wrap-up Brightest Day, I thought it was a good time to look at how Ronnie Raymond died. He was killed in Identity Crisis #5 (December 2004) which was written by Brad Meltzer, penciled by Rags Morales, and inked by Mike Bair. It wasn’t a glorious or heroic death. Ronnie was killed by the Shadow Thief using The Shining Knight’s sword. It was a minor scuffle, the kind superheroes partake in all the time. Brad Meltzer’s intention with this scene was to show that sometimes heroes die a quiet, accidental death on the job. Below are the pages showing Ronnie’s death as narrated by Oliver Queen, Green Arrow. Poor Ronnie. A really unfortunate way to go. Thankfully he’s been given another shot! Posted in: Comic books, Firestorm #05: Ron solo, Ronnie Raymond. I’m not a fan of Brad Meltzers work and this is one good reason why. It’s not a bad scene, but it does trivialise superheroes. 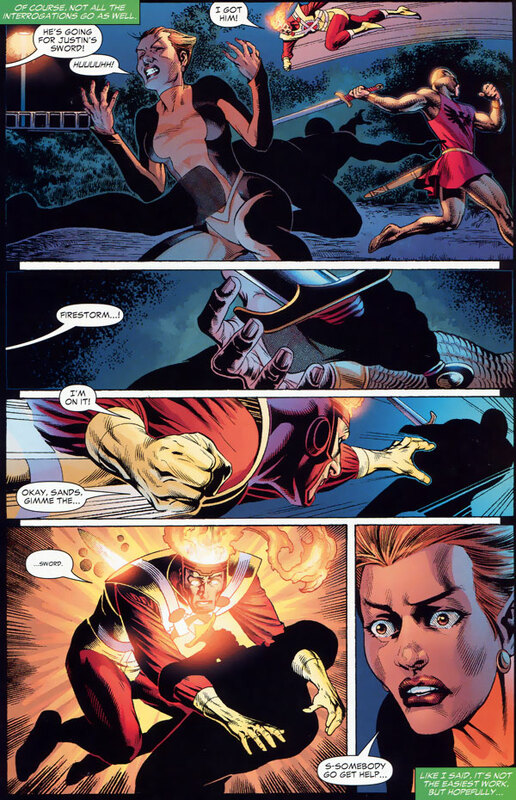 Not only an “unfortunate” way to go, but completely in contradiction to how Firestorm (and his powers) had historically been demonstrated in the past. Thankfully, we can now begin the process of ignoring that this ever happened. While it wasn’t the way I would have liked to see Ronnie go out I didn’t mind the scene. I always saw the scene as what would happen when you put heroes together in a crisis that are not use to working together. 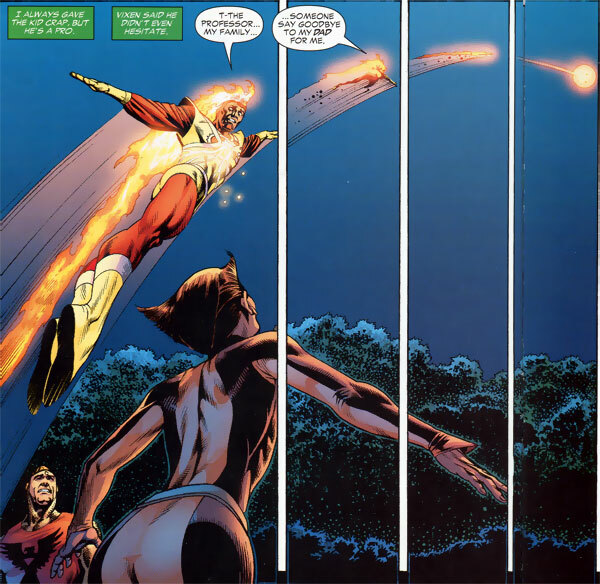 Rarely do yous see Firestorm, Vixen, Captain Marvel, and the Shining Knight working with each other. I’ve noticed since that scene the Shining Knight has disappeared. There of course is the new Grant Morrison character that has been showing up here and there. It would be an interesting scene to see Sir Justin interact/apologize to Ronnie now that he is back.